"Obverse: undated, view of THE THEATRE AT NEW YORK (Park Theater), with legend around. AMERICA in exergue, JACOBS in small letters below. 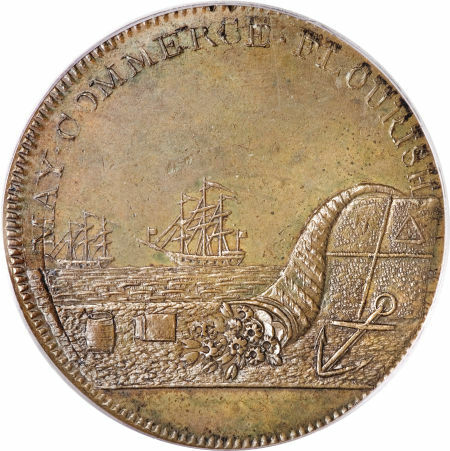 Reverse: MAY COMMERCE FLOURISH around, two sailing ships in distance, dock with cornucopia spilling out a cask, package, and flora. Anchor and four-paneled square at right. "The token is one of the nicest of the Conder series, being struck on a wide and thick flan. Most known are in higher grades with good color and reflective fields. They were clearly not admission tickets, as Kleeberg showed, but rather, were made for collectors, accounting for their present condition when found. The reverse die failed fairly early on it its life and most specimens known show varying stages of buckling ... ."
The edge purportedly reads I PROMISE TO PAY ON DEMAND THE BEARER ONE PENNY X. Kleeberg has shown that several catalogers, including Breen, mistranscribed the I on the edge as a WE (although Dalton & Hamer state it correctly). Peter Skidmore struck the The Theatre at New York penny tokens in London from dies engraved by Benjamin Jacob, who issued several tokens including one for himself in 1798 where he was identified as an "AUCTIONEER, IRONMONGER & c" at Welsh Cross in Birmingham. 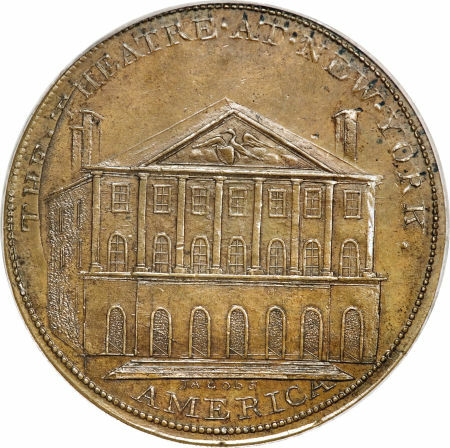 That token and the New York Theatre token were made with hand-cut letters rather than punches (witness the slightly different style of the Rs in THEATRE, YORK, and AMERICA). Jacob also did an entire series of halfpence tokens depicting London churches and gates based on copperplate engravings. The use of the final S on the New York Theatre token may signify the possessive Jacob's. Jacob did most of his diemaking work, including the Theatre token and the London church series, for Skidmore, who manufactured the tokens at his metalwork factory. Skidmore and his father were partners from 1797 through 1809 in Skidmore and Son, makers of stove grates. Likely to capitalize on the late-19th century collector craze for Conder tokens (which were first produced for much the same purpose as the later Civil War merchant tokens), the son expanded into tokens, produced in their factory at 15, Coppice Row, Clerkenwell, and sold at the store at 123 High Holborn Street, London. Rulau comments that "there is no indication that these pieces ever had any connection with the theater; the memoirs of William Dunlap, the manager at the time, do not mention them." Jacob apparently copied his building engravings from printed materials: The view of the Park Theater comes from a 1797 New York City directory. Most known specimens are proofs. This piece shows no signs of buckling, but as mentioned it has some diecutter's marks on each side that provide pedigree identifiers. Ex: 2007 Milwaukee Signature Auction (Heritage, 8/2007), lot 1523, which realized $32,200. (#90658)"